Sunday in Rome on a wonderful sunny day. We found the city full of soccer fans cheering already in the morning for a game, the final Italian cup, that was to take place in the evening. 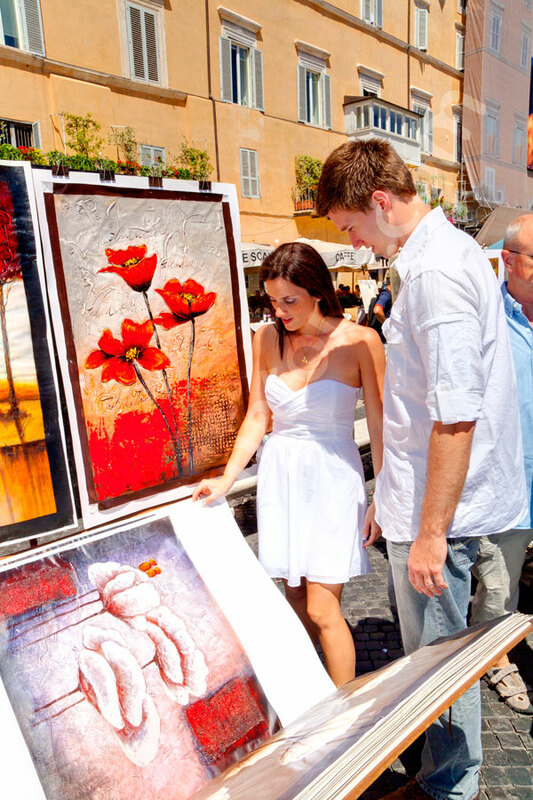 When we started in Piazza Fontanan di Trevi we were cheered by crowds as we began taking pictures! Kind of on the balance between cheery and hey what’s going on! We swiftly used a car service to move from place and place and reached the nearby Piazza di Spagna and Trinità dei Monti where we found even more soccer fans waving the pink colors of their team. Some wonderful pictures came out here and interesting games of light. We later moved to Piazza del Campidoglio where we photographed on the stairs and over the ancient Roman ruins. 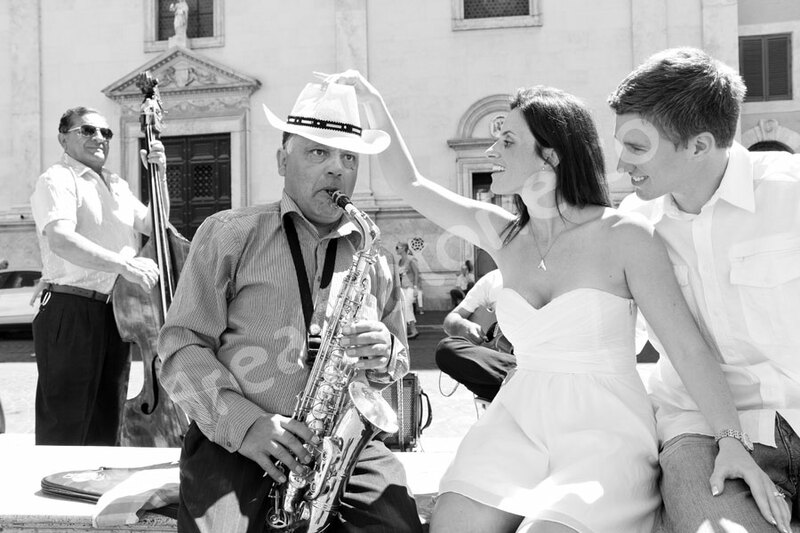 In Piazza Navona we found these musicians which contributed with a funny spirit for some more playful pictures. The piazza has so much to offer and we easily found more nice photo ideas while strolling around. We then hopped in the car and drove over to Gianicolo where daily at noon they fire a canon in the direction of the Tiber river. We then stopped over the Fontanone fountain overlooking the city of Rome and ended the tour with a nice walk in the Trastevere area. Thank you so much for the wonderful time together! Please find below more selected engagement session taken from the Blog. 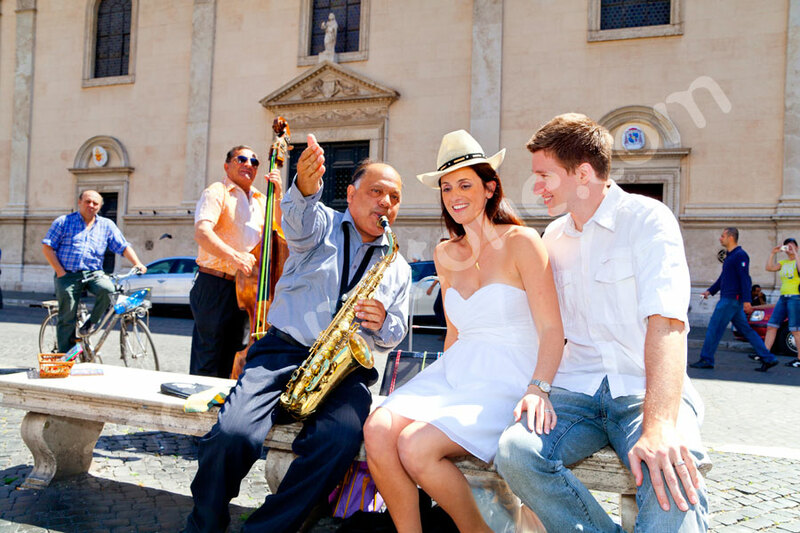 Engaged in Rome and enjoying the photo session around the city using an efficient car service. Taking them though the main landmarks including some off the beaten track places. Capturing unique engagement photos.